I love fragrant flowers and try my best to collect them in our garden. Many of them have to stay in pots as they are tropical plants. As we are running out of space in the basement, I try not to get a new tropical plant. I also try not to propagate plants I have. It’s hard to do since I regularly prune them in spring when I take them out in the garden. I don’t want to throw healthy branches away so I stick them in a new pot and they take root. Some plants have been with us for many years and have grown much bigger so space is getting tight down there. I couldn’t pass up the Cashmere Bouquet (Clerodendrum philippinum) when I saw one in a nursery offering a couple of years ago. Even though I know how fast it can grow and its need for space, but one is enough. 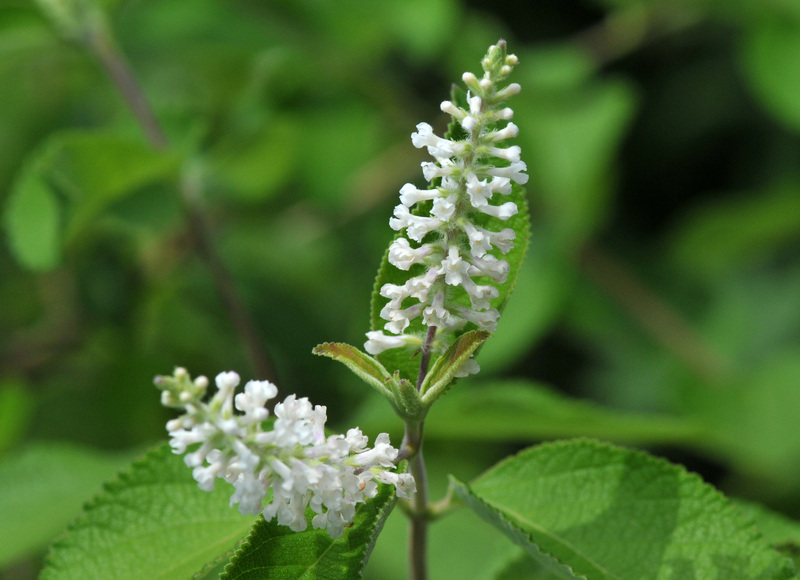 It a big leaf plant with white, sometimes pale pink clustered flowers. 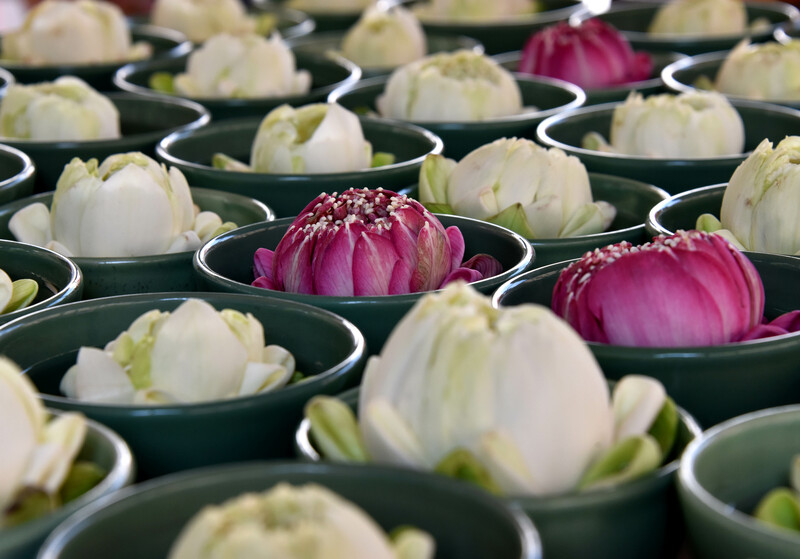 It’s fragrance is lightly sweet and musky and cannot be replicated. It reminded me of home, of childhood. 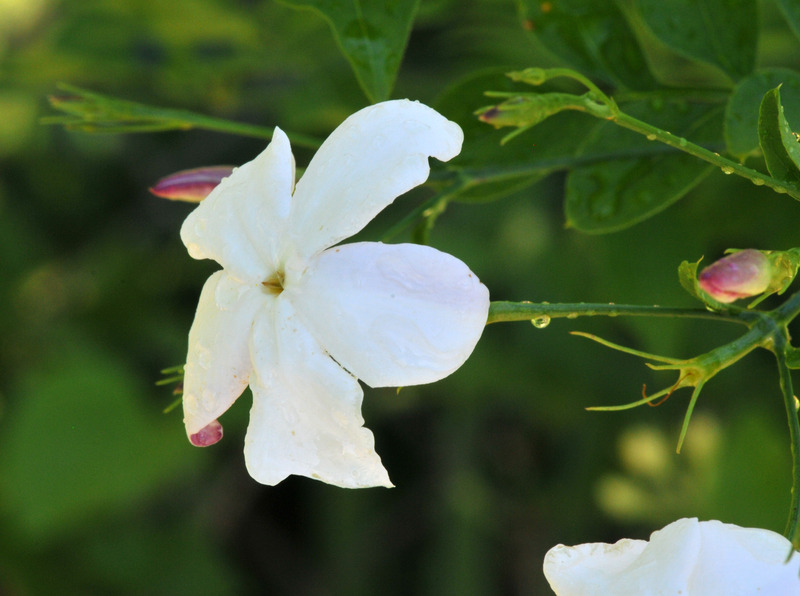 I think it’s the same reason why I grow jasmine and have been collecting varieties of them. I mentioned that one plant is enough, but they are two now. The old habit is hard to get rid of. I repotted it in spring to give it some legroom but I also split it at the same time. I wish I could grow it in the garden so I could have a whole patch. It can be grown out side in warmer USDA Zone 7 and up. But be warned, they can produce suckers and develop a colony very fast. If you wish to grow it in a pot, it may not bloom as it likes direct sunlight. But if you have a window with plenty of light, it’s doable. One year I had a plant light right on it, to my surprise it bloomed in winter. Keep the soil on the dry side otherwise it will rot. I love eating Sweet Tamarind and spicy tamarind candy so much so that I forgot it has a laxative property. Tamarind juice is also used in many beverages and cooking. You cannot make real Pad Thai or Massaman curry without tamarind juice. Young leaves and flowers are also good in cooking. The juice is also good as a non-toxic polisher for brass and silver. Wood is also good used as a cutting board. The plant can be trained as a beautiful Bonzai. As much as I want to grow it as a tree because of the benefits it provides, I cannot grow it in our garden in this climate. So, I settled for growing it in a pot like the other tropical plants I have – for the beauty of it. When I mentioned to my friends and colleagues that I attempted to grow tamarind (Tamarindus indica) from seed. They asked either …why? or questioned whether I know that tamarind is a very large tree. Yes, I know tamarind is a long lived, large tree that can grow over 50 feet tall. Why would I want to grow it then? It’s because I want to know I can grow it from seed in a cold climate. I love its beautiful leaves and it can be made it into a Bonsai. If they grow well, I can eat their young leaves, flowers and fruit. Fruit is less likely, actually, due to a very short high temperature season and resulting lack of sunlight in this climate, USDA Zone 5-6. I kept seeds of Sweet Tamarind after having eaten the yummy flesh. Yes, there is a type of tamarind fruit that turns sweet when ripened. I put them in warm water and let them soaked over night before I put them in a growing medium. I put the tray on top of a heat mat that was set to 75°F. Looking back at my 2015 garden record, I put the seeds in on March 31 and they sprouted on April 11. I was surprised to see them germinate in two weeks. Once they grew around 3 inches tall and produced a pair of true leaves, I transferred them to larger pots. They seemed to grow fast when they were very young but after a year the growing rate seems to slow down. I’m not really sure if it’s normal for tamarind or it’s because they have to spend 6 months in a cool basement, under artificial sunlight. Will they grow faster if they sit on a heat mat in winter? I don’t know but I don’t have the space to put them on a heat mat as an experiment. Transferred from a seed-starter to a larger pot after the leaves were fully unfurled. Out of eight seedlings that sprouted in 2015 only four survived the first year. I think I may have watered them too much. Tamarind does better in semi dryness. In their natural habitat, they survive drought and do fine with less than fertile soil. The survivors are now almost two years old and thriving in the basement at the moment. They are around a foot tall but branching out with a lot of beautiful leaves. I haven’t decided if I want to keep them at a Bonsai height or let them grow to four feet tall (the height that can easily be transported in and out of the basement). Relaxing in the basement with other tropical friends in winter. In a couple of months they can enjoy warm weather and real sunlight again. I’ve learned that watering tamarind too much will kill it, so each one of them will stay slightly on the dry side. I have not encountered any pests or diseases yet. As far as I know they are fairly pest-free in their natural habitat. I look forward to seeing them flower, maybe five to six years from now. They may not flower at all, but like our Kaffir limes, the oldest of which is around 20 years old, thrive but never flower. By then, any survivor should be something of real beauty. 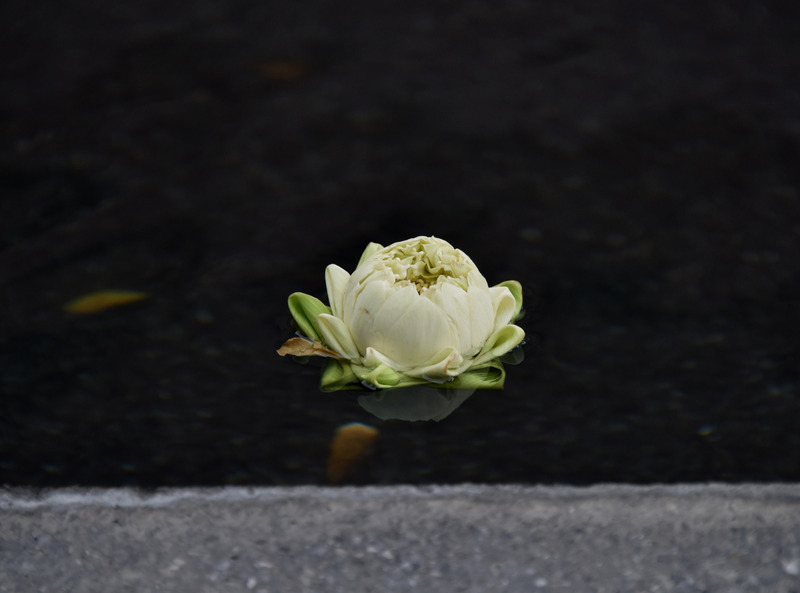 I prefer to make an offering in what ever method is considered respectable in whatever country I visit; Buddha, Stupa, Bodhi Tree, River, Ganesh, Shiva Lingam, to name a few. I don’t see any harm in making an offering since the act exists in all cultures and can be traced back as far as ancient Egypt. Whether I believe this ritual will bring me anything is another story. My parents taught me that ‘Even if you don’t believe, don’t insult’ so respecting what others believe has always been my principle policy. 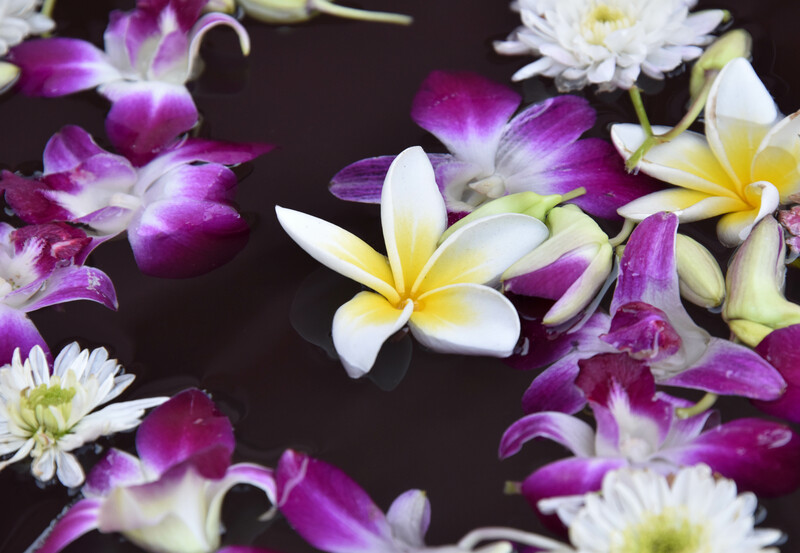 Lotus, Jasmine, Marigold, Plumeria and Orchid seem to be common offering flowers in Asia. 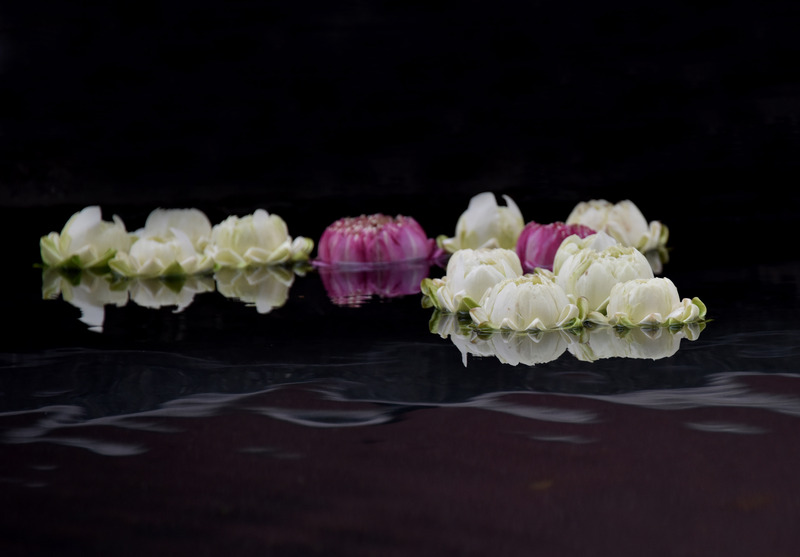 The flowers in general represent prosperity and abundance. 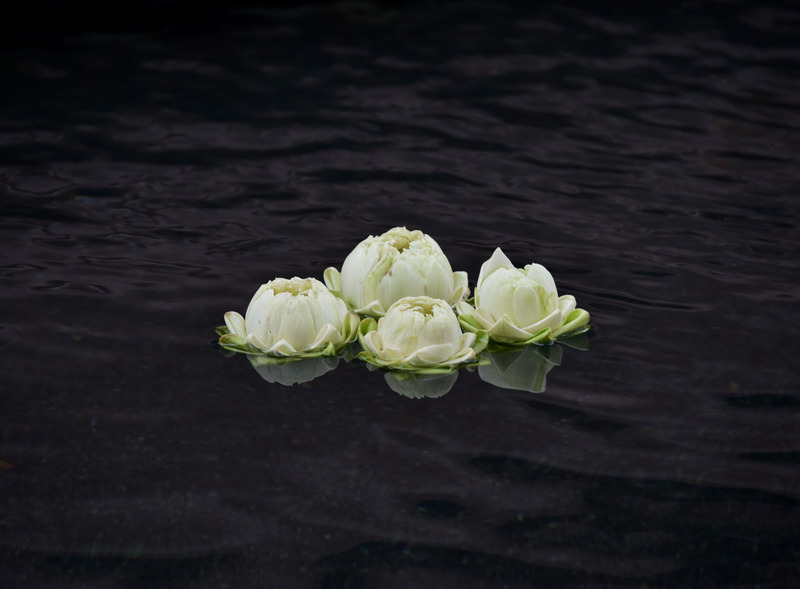 The water represents peace and abundance. 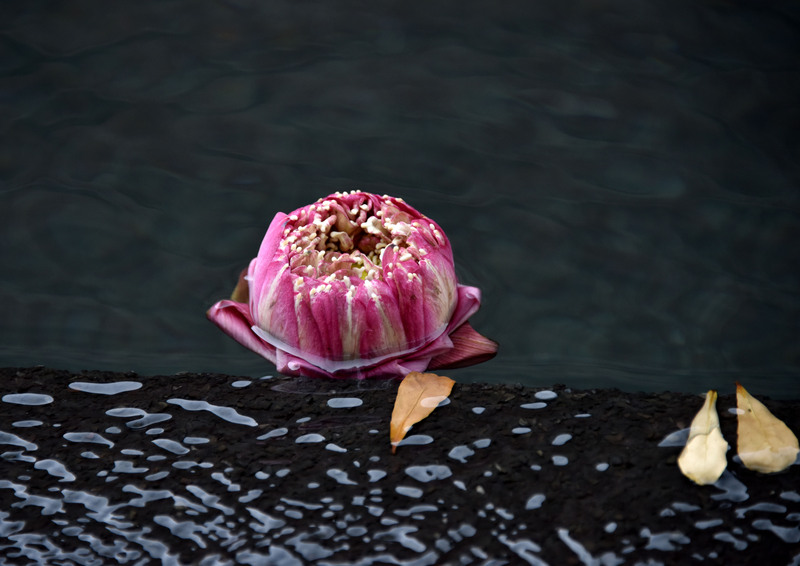 Whether prosperity and abundance materialize or not is anyone’s guess, but watching lotus offerings floating slowly down the stream, circling one another and stopping at the edge of the reflecting pool was very peaceful. I have taken leave to the other side of the world for a couple of weeks. Though I didn’t have much time to look around as I usually do, still common tropical flowers were the cheerful sight to be seen. Nothing much in North America but bare branches and snow. So, sharing some colorful images of these common tropical flowers wouldn’t hurt. 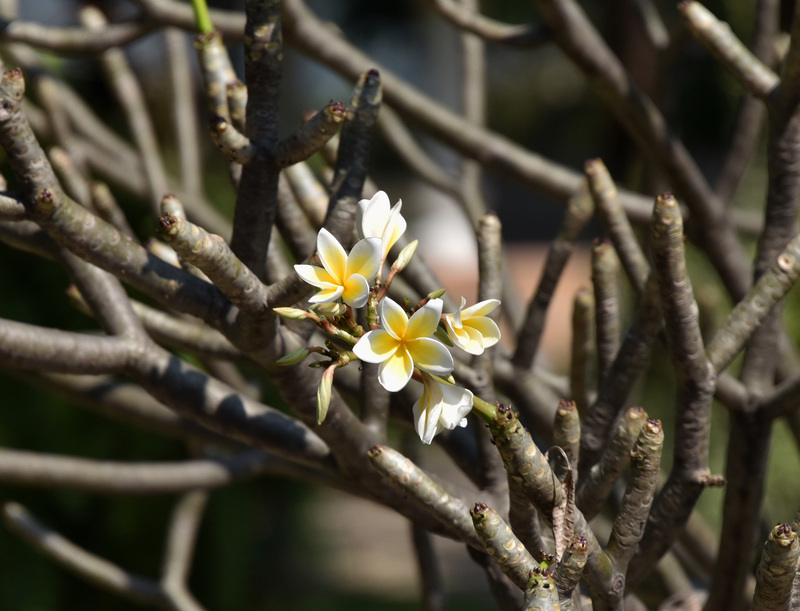 Plumeria (Plumeria obtusa) flower has a very soothing fragrance. This plant in the photo is around two stories high but Plumeria can be grown in a pot and kept short and tidy. 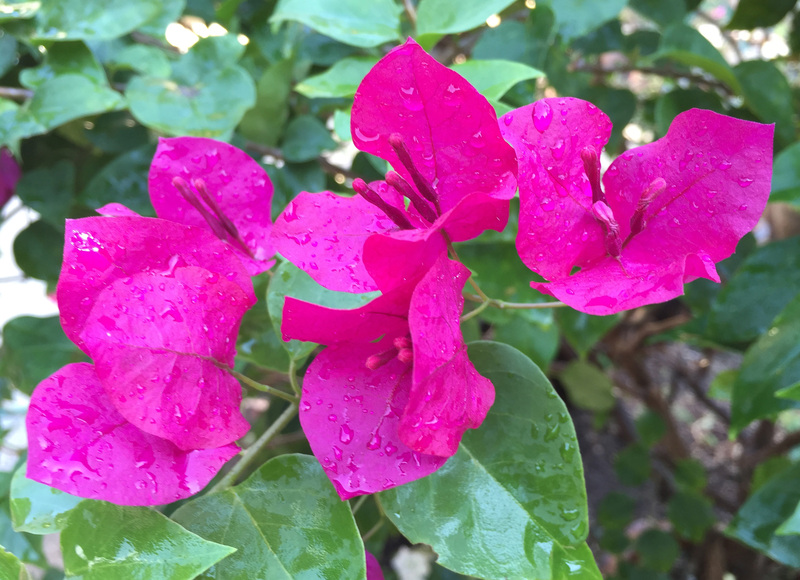 Paper Flower (Bougainvillea) is another common tropical flower that can take negligence and drought in stride. 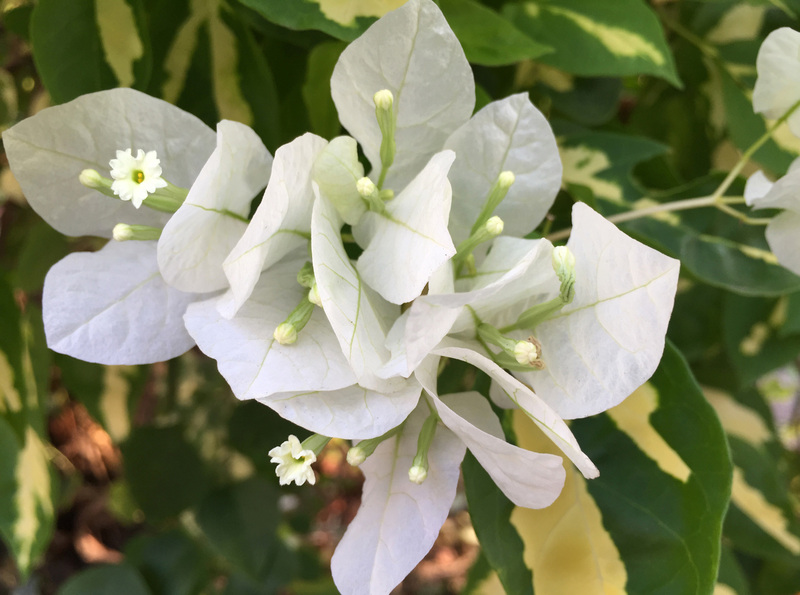 It comes in many colors, from white, bright pink, orange, yellow, red… It blooms throughout the year and is great for trellises or climbing on a fence. 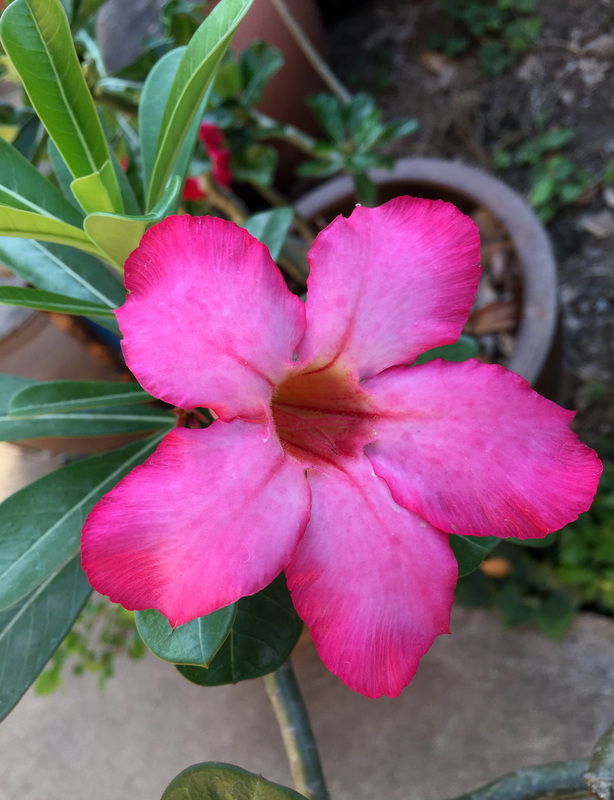 Desert Rose (Adenium obesum) is another flower that does well in heat and negligence. It comes in both single and double petals as well as in a variety of colors. I attempted to grow it here once, but too much pampering with food and water, I killed it. I guess they call it ‘Desert Rose’ for a reason. 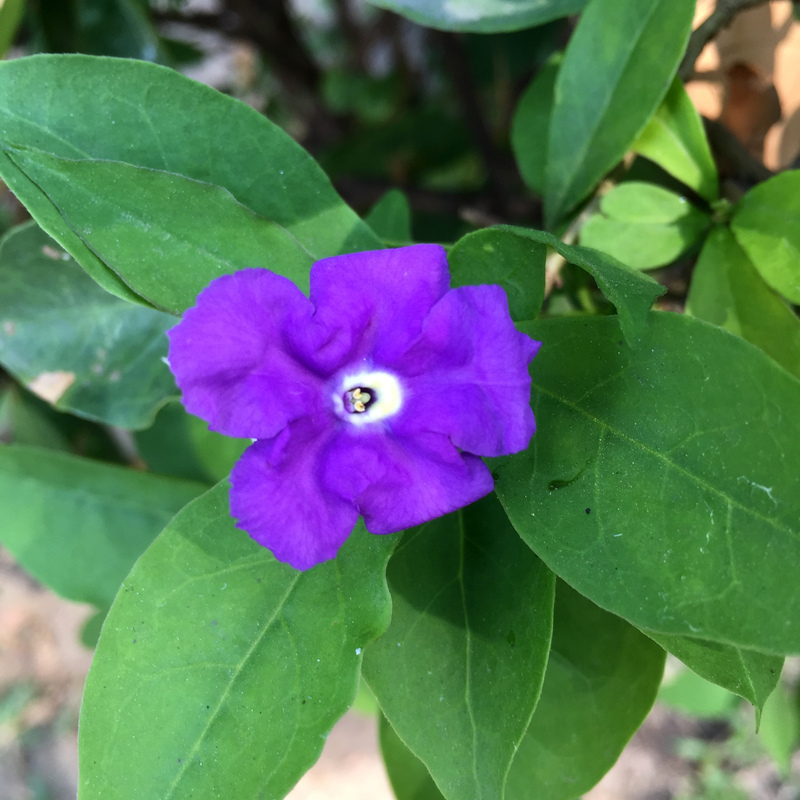 The flower of Paraguay Jasmine (Brunfelsia australis) aka Yesterday-today-and-tomorrow is slightly fragrant. The flower first opens up in violet then fades to pale pink and white at the end. 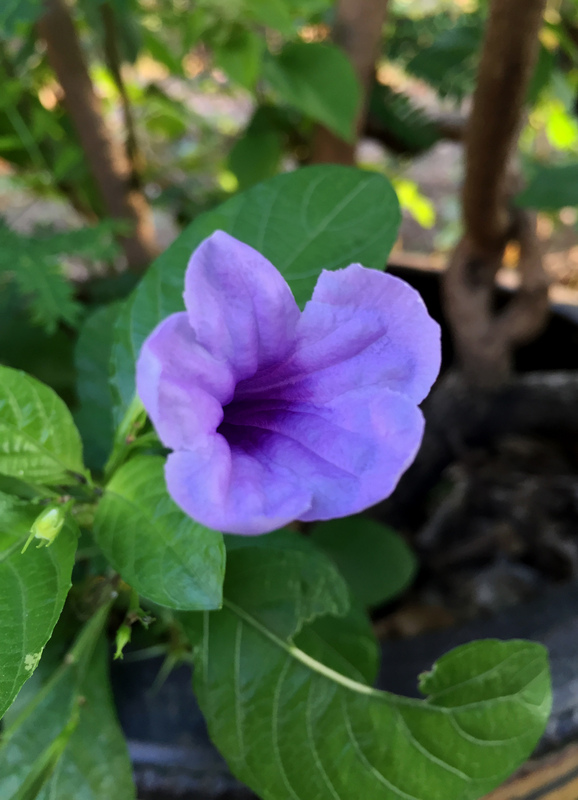 This lovely violet flower-Wild Petunia (Ruellia tuberosa) is classified as a weed with herbal properties. Since people tolerate them because of their beautiful color, they can be seen along side local roads and highways. I’m not advocating growing non-native plants but most plants above can be grown in a pot in USDA Zone 3-8 or in the ground in Zone 9-11. What’s left blooming in our garden now are just some hardy roses, calendula and the broccoli that we let bloom for the bees (though technically a vegetable). The re-blooming iris are just producing flower buds which may or may not bloom. The weather has been staying around 50º F during the day and drops down below 40º F at night. Last week it dropped below 30º F for a couple of nights and that stunted the growth. The iris will bloom again if the weather stays above a frost. I’m keeping my fingers crossed. There may not be much left in the garden but down in the basement where the tropical plants reside in winter there is still activity. 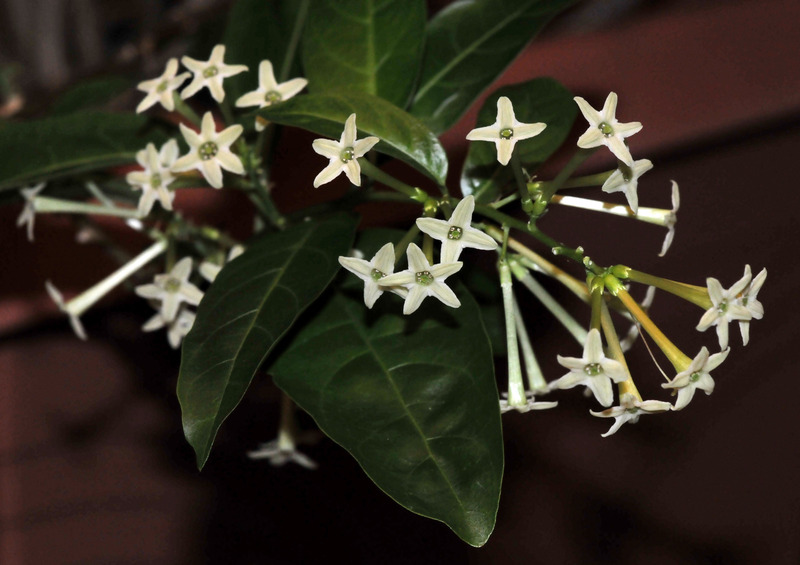 I can smell perfume wafting up the basement stairs from a variety of jasmines every time I open the door. I’m thinking of taking a table and chair from the garden and putting them down there so I can continue the joy of being in a tropical garden in winter. The Night Blooming jasmine (Cestrum nocturnum) are doing well this year. I re-potted the largest one to its benefit. I also propagated a few plants from the main one and gave some to friends. 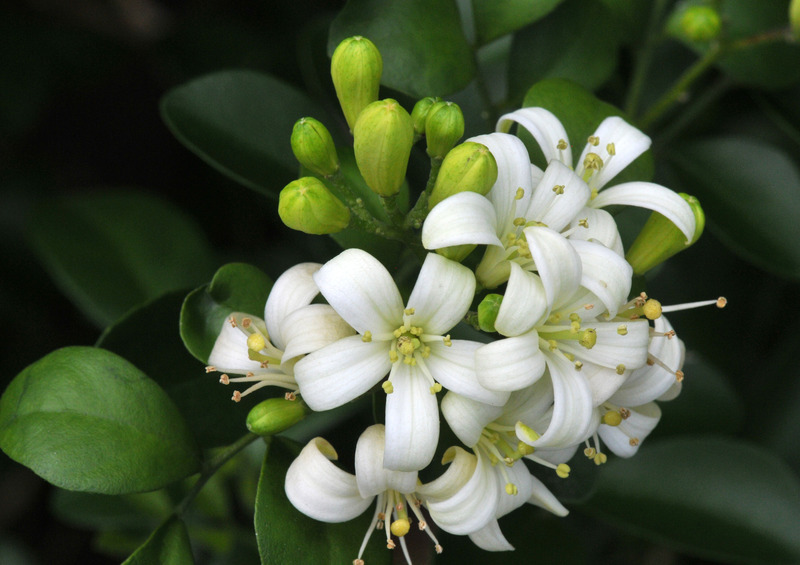 They perfume the basement now, competing with the Orange jasmine (Murraya paniculata). 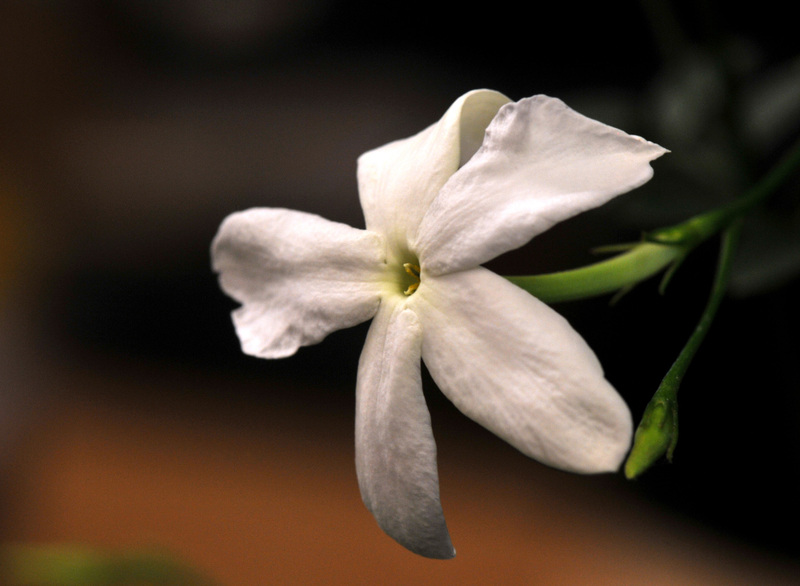 Jasmine ‘Poet’ (Jasminum grandiflorum) loves cooler temperatures and started to bloom profusely outside, but it continues to bloom down in the basement. 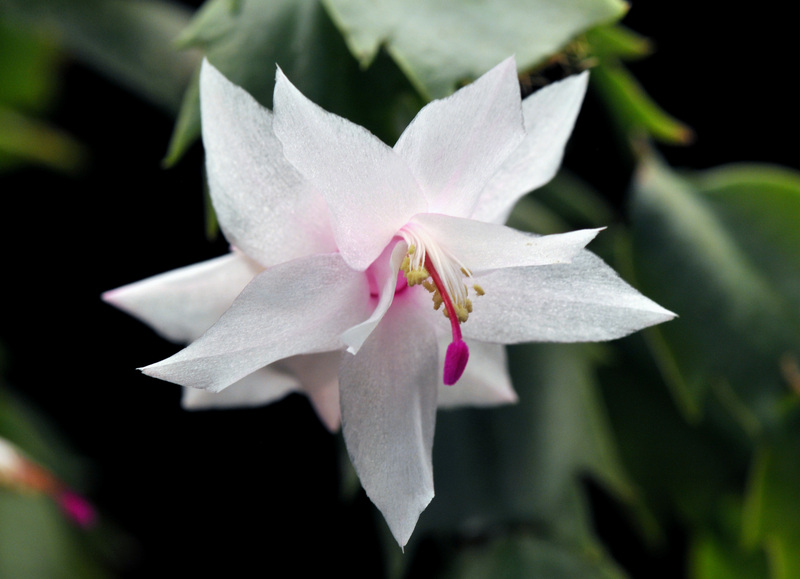 One of the Christmas cactus (Schlumbergera hybrid) bloomed as soon as it got inside. This is a hard to kill plant. No matter how negligent the treatment I give them they never miss producing flowers year after year. 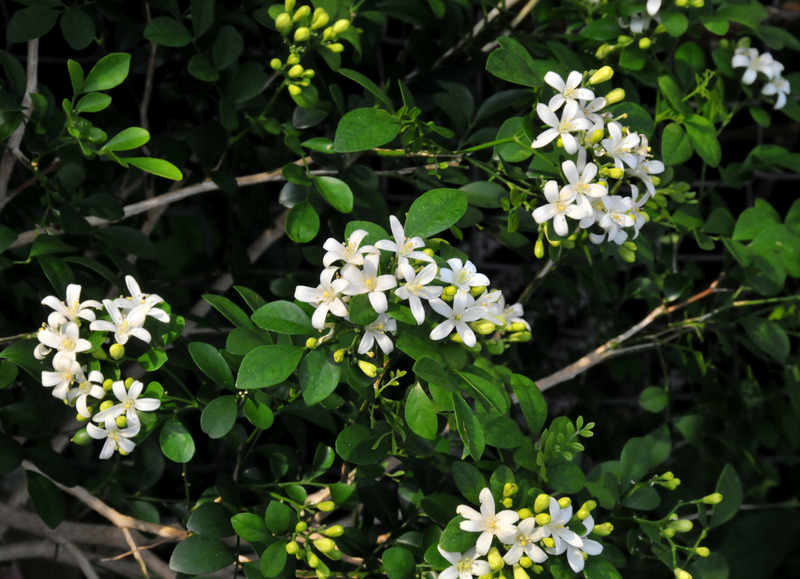 I took this Orange jasmine (Murraya paniculata) photo back in June when it enjoyed sunlight outside. It still blooms here and there until sometime in the middle of winter when it will bloom heavily again. It’s a little bit too cold for mid-September this year. Some nights the temperature has gone down below 40°F and hovered around mid 50°F during the day. But it has gone up to 70°F during in the last two days. The thirty degree gap between high and low temperatures makes it difficult for me to decide whether to move the tropical plants back down to the basement. Although it’s not yet freezing, these plants don’t like to stay in a temperature below 50°F, but I do want them to get real sunlight as long as possible. I think I’ll move them this weekend if it doesn’t rain. Better safe than sorry since many of them have been with me for many years. They have been putting up with confinement (in a pot) all these years so I shouldn’t discomfit them further. 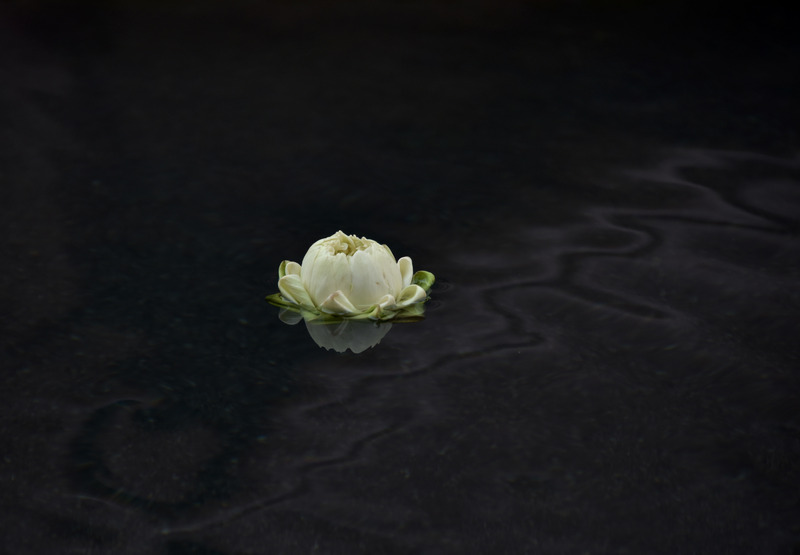 The weather may not have been on their side this summer but they still offered fragrant flowers throughout the summer and some of them are still pushing to bloom even when it’s a little bit too cold for them. 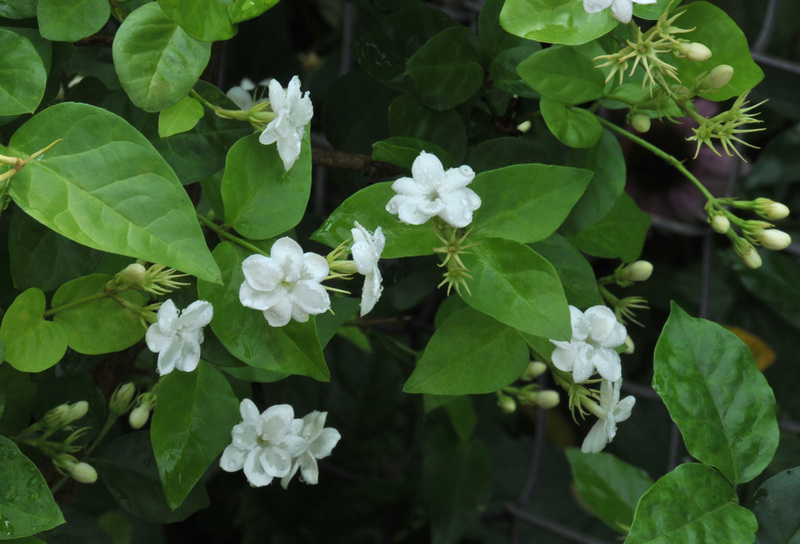 ‘Azores’ jasmines (Jasminum azoricum) have just produced new flower buds that will blossom when they’re already in the basement. They flowered through mid-winter while residing in our basement last year. ‘Poet’ Jasmine (Jasminum grandiflorum) seems to like cold weather. It started to bloom more when the temperature dropped and is still blooming. 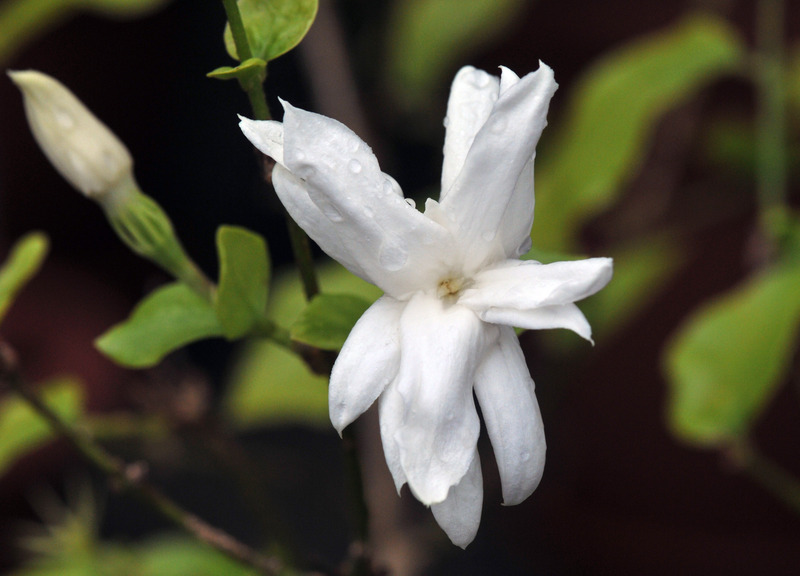 ‘Belle of India’ jasmine (Jasminum sambac) really struggled this year. Its’ leaves dropped at one point when it had been raining for a several days and it was forced to sit in water for a bit. It managed to produce a couple of flowers anyway. I repotted, changed the soil and trimmed the roots of the ‘Maid of Orleans’ jasmine (Jasminum sambac) this year. I gave them a close pruning as well. It’s a ritual I do every couple of years for all the potted plants so they can have fresh dirt and more leg room. They respond well by producing bigger flowers abundantly. Almond verbena (Aloysia virgata) is happy after receiving a crew cut early this spring. It can grow pretty lanky and floppy when it doesn’t get enough sunlight. Now it’s a little more compact and blooming better too. 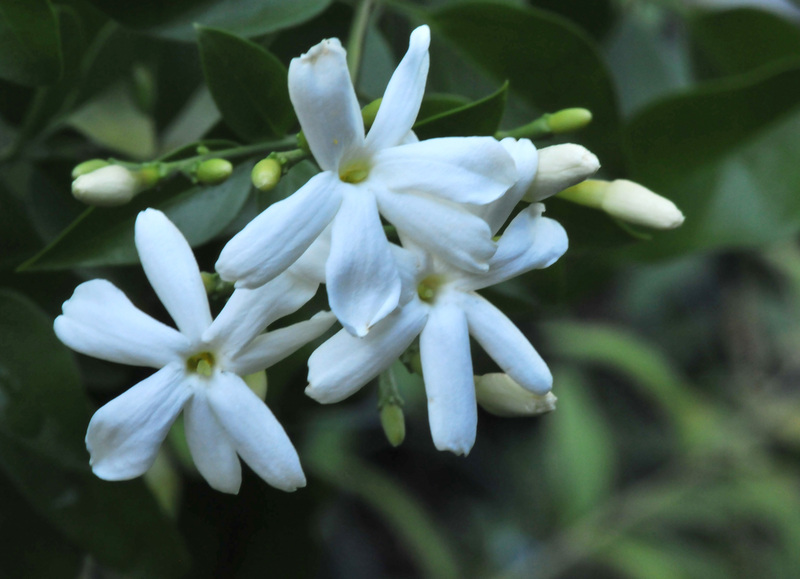 Orange Jasmine (Murraya paniculata) produced a lot of flowers earlier this summer and is still flowering here and there. Their three inch tall offspring seems to want to flower as well. Maybe because they are closer to the house and warmer.